Somethin Odd: Unusual and Ugliest Building on Earth? It's a rather dubious honor to be considered the ugliest of just about anything at all, but according to many, the 105-story Ryugyong Hotel in Pyongyang, North Korea appears to be the winner of the ugly building contest. The Ryugyong Hotel with its 3,000 rooms has been described as a hideous and distorted version of a fairy-tale castle that dominates the city's skyline and is so ugly that it is frequently air-brushed out of publicity shots of the city. Construction began in 1987 (although no one knows why) but stopped in 1992. It is unlikely that it will ever be finished due to the fact that North Korea ran out of money and there is no tourist industry in the region. 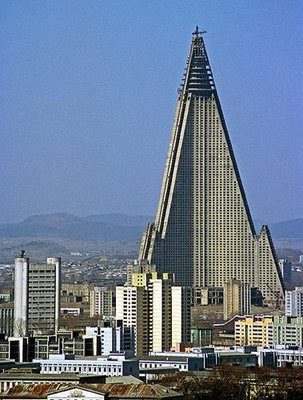 Ryugyong Hotel remains an eyesore that should not to be viewed after eating. There it stands and will for many years to come, unfinished, unwanted, and very, very ugly! What you guys think about this hotel? Is it really ugly or kinda nice work?